Acne is a common affliction of the sebaceous glands, afflicting nearly everyone, at one time or another. The sebaceous gland disorder concerns the overproduction of sebum, more so than be excreted by the glands to the surface of the skin. Zits or pimples then ensue. 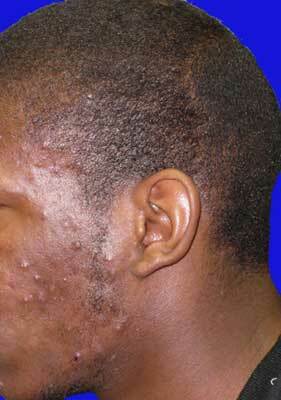 Figure 1: Acne cosmetica – acne flared by applying lotion. 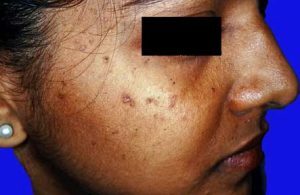 Figure 2: Acne ecoriée de jeune fille – lesions that have been picked and not necessarily limited to young women. Scrubbing – The skin is irritated enough. At one time, it was thought that scrubbing the skin would eliminate debris, and the sebum could poor out. Not only were wash clothes suggested, but also scrubs with aluminum granules were recommended. Unfortunately, this type of irritation only caused more acne pimples. Sun exposure – While sun or ultraviolet light treatment can cause some peeling of the skin, continued use often creates irritation to the sebaceous gland openings and more acne. This explains why acne may seem better in the summer, only to flare in the fall, when there is less sun to peel the skin.